← Is avoiding failure a valid business and life strategy? People come to Floyd or places like Floyd because they have this dream, you see, of enjoying a simpler and more satisfying lifestyle. The image above seems to capture that idyllic quality. There is more room and fewer people in the country, but you have to create your own lifestyle and that takes hard work and dedication to make it happen, just like anywhere else! I met this family recently which has established a store on their farm. They are cheerful, hardworking people and every one of the family members, including the smallest children, seem to have a job. On this particular day, the mother was cutting the hair of a younger boy on the front steps. She told us she had taught herself to cut hair by doing it and had gotten better at it as time went by. 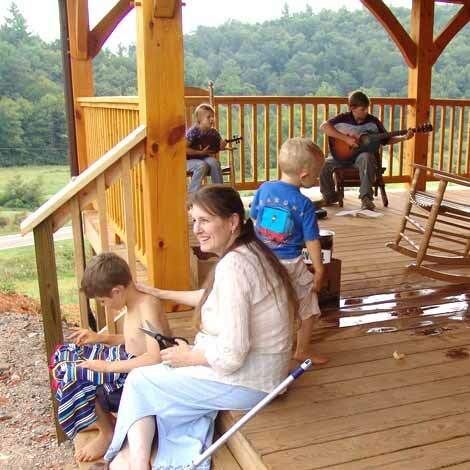 Two older children played on the porch behind her, with their sheet music spread out on the porch floor in front of them. 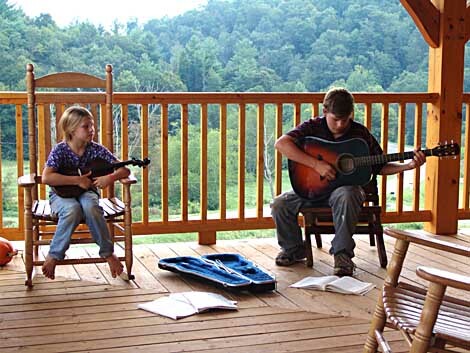 The boy played guitar while his sister sat listening to him holding her violin. Two older daughters were in the store waiting on a steady stream of customers. They sell produce grown on their farm along with meat and produce from other farms in the region. The store is spotless and the food products are high quality and very fresh. The service and food quality is a match for Whole Foods or any of the other high-end natural food markets I have used in the past. Those of us who live in the area have spread the word about their Farm Store and traffic seems to build every week. An incredible amount of hard work has gone into creating a store of this caliber and more remains to be done. The steep gravel driveway leaves no room for error on the part of patrons. One moment of inattention and you will need to call a tow truck to get you back on the road. The father of the family made a judgement call and decided to open the store in time to catch the growing season, even though the driveway, landscaping, and product inventory was incomplete. His decision was the right one, but that was evident only after a lot of hard work and excellent organization created a successful store with satisfied customers. Before leaving, we bought fresh corn, crisp green beans, fresh plump beets, and some sweet baby summer squash that begged to be sauteed with some sweet onions. There is more to this charming country scene than is apparent to the casual onlooker. Do you agree? Where is it? Always like knowing where good food, and good ideas, are. For the longest time I subscribed to a magazine called “Country.” I loved looking at the pics and dreaming about living in a rural place. Right now I live in Boston. But one day…. I think these young people came to see me here at the shop on Monday; one of the daughters and I share a love of Jane Austen, and another daughter is an aspiring spinner. We had a terrific visit!